The Community Gardens provide a wonderful opportunity for people of Missionvale to learn a new skill while producing a variety of vegetables. The gardeners are provided with their own garden plot, seeds, fertilizer, and the necessary tools and water to maintain the garden. They tend to their seasonal vegetables which may include corn, carrots, cabbage, spinach, onions, tomatoes and much more. 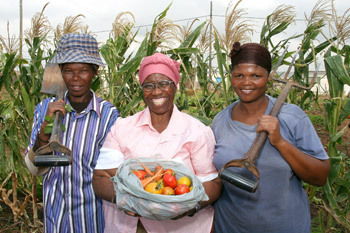 Many of the gardeners take their harvest home to their family while others produce enough to also sell to their friends and neighbors. This helps transition some of the people away from the daily food program of bread and soup powder and create more of a self-sufficient environment for them.